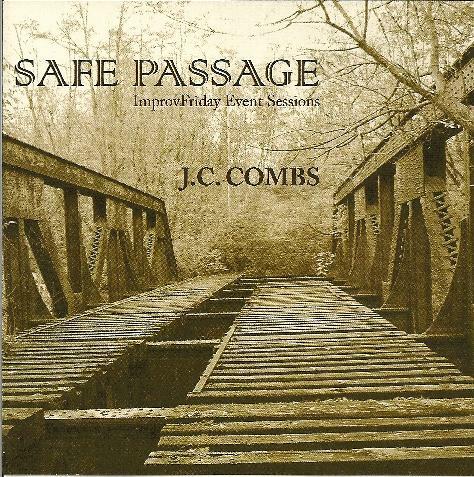 J.C. Combs - "Safe Passage"
Safe Passage is Seattle based composer J.C. Combs' first release for the Electroshock label. Sub-titled ImprovFriday Event Sessions, the CD consists of works created by Combs for the weekly event of the same name the composer participates in with new music improvisers and sound artists who gather to share their works. The album consists of 10 tracks, most under 4 minutes. My experience of experimental audio art is usually lengthier pieces that take time to evolve, which also gives me as a listener time to wrap my brain around them. These relatively short pieces, therefore, come across as audio sculpture snapshots. Standout tracks include Cross Station, a train station scene with crowds and announcer, embellished by percussion and electronic waves. Dispatch blends machine shop sounds, children's toys, voices, and electronics. I enjoyed the percussion, electronics and efx'd voices, culminating in an intense ghostly ambience on November 13, 2009. Abysmal has a very interesting mix of field recordings from nature and associated soundscapes, plus a women singing to a pulsating musical sort of ambience. And the rollicking jazzy doo-dah band on the title track is combined with field recordings to intriguing affect. There are two tracks on the CD that stretch out and develop a bit more. The 8+ minutes The Giant Eye of the 5th Dimension consists of spaced out electronics and soundscapes, plus various aquatic, urban, natural sounds and voices, and the piece even gets somewhat musical at times. The nearly 7 minute Trinity 666 - The Last Train to Hell features a man speaking in German combined with continually changing spiritual themed television and/or radio shows, train whistles, and tribal percussion. Near the last couple minutes things go briefly quiet and then the remainder of the track consists of light rain and thunder. A stimulating mix of sounds on this aptly titled piece and my favorite track of the set.